Visitors with a taste for adventure–plus a side of relaxation–can check out a new adventure yacht docked in Waikiki. 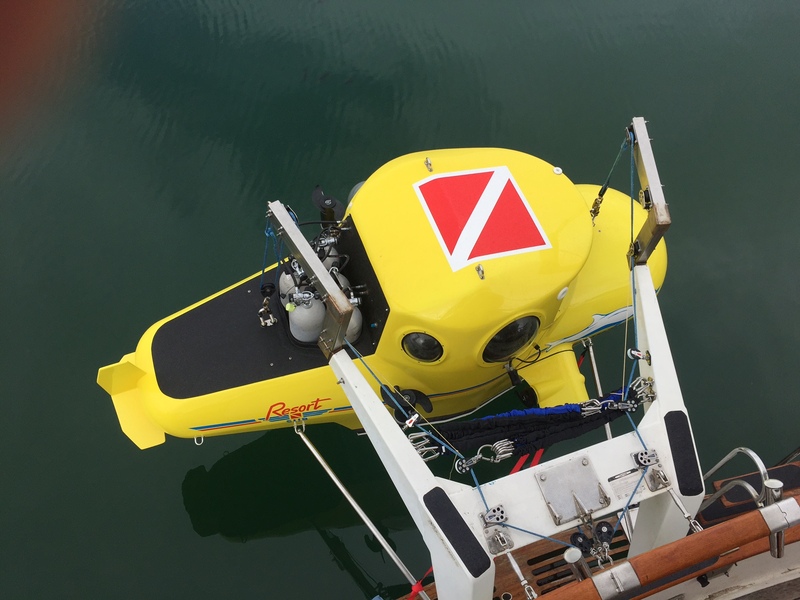 Lux Aquatica Hawaii just unveiled the 54-foot Avery Claire, which features a vast array of adventure gear, including a three-person submarine. The yellow exploration submarine is equipped with scuba diving equipment. It can reach depths from 20-125 feet and allows passengers the opportunity to enjoy a private underwater tour of the Hawaiian ocean while chatting with family and friends about marine life encounters. A three-person submarine is available on the yacht for adventure-seekers. According to Captain John Morton, the submarine also has attached cables which allow passengers to explore coral reefs and other sites outside the vessel. Capt. Morton says, “We can go just about anywhere. A Zodiac inflatable speedboat is also on board for water activities such as wakeboarding, water skiing, fishing or just a thrill cruise. Accomodations are for six guests and include three air-conditioned private staterooms, two private bathrooms, a spacious kitchen/living room, and a media room. 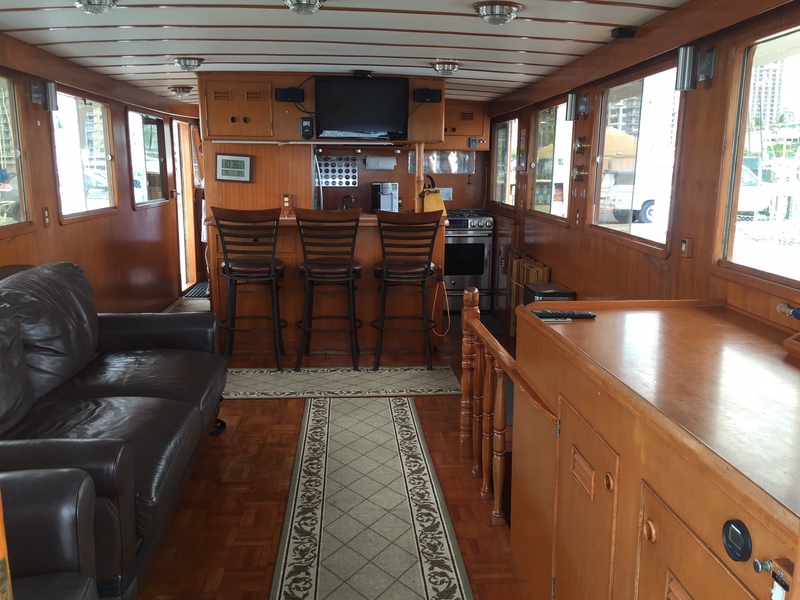 A spacious kitchen/living room on the yacht feels comfortable and inviting. He added, “We are Hawaii’s ocean entertainment experts. Depending on your desires, we customize either the most serene, beautiful and perfect leisure experience that yachting has to offer — or pure excitement with a shot of adrenalin. It’s your choice. Our private tranquil cruises offer breathtaking panoramic views of Oahu’s coastline and Honolulu’s city lights from the sea. Passengers see dolphins, manta rays, sea turtles and humpback whales in season, and unforgettable sunsets. Those seeking more action and adventure can jump right into the submarine for the most exciting ride of their life,” said Captain John Morton. LUX charter counselors and crew are available to tailor experiences such as a moonlight dinner followed by night diving. stand-up paddle boarding, reef photography or spearfishing for lunch from the LUX submarine. Counselors work with passengers on an individual basis to design the parameters of the LUX Aquatica custom cruise experience. And, for those who want to go all-out? “We could bring in a private chef, whatever type of food you would like–we can cater to your desires,” said Capt. Morton. Prices start at $800.00 per hour for a basic three-hour cruise. You have the option of extending beyond three hours. A luxury diving charter costs $1000.00 per hour and includes a submarine dive. You also have the option to extend the cruise beyond three hours.